With the introduction of the muscle-car-inspired Judge, Victory has taken a sharp and deliberate turn from its well-worn path of creating blingy cruisers, bagger/touring rigs, and bobber-themed rides like the High-Ball and the new Hard-Ball that melds bobber with touring. 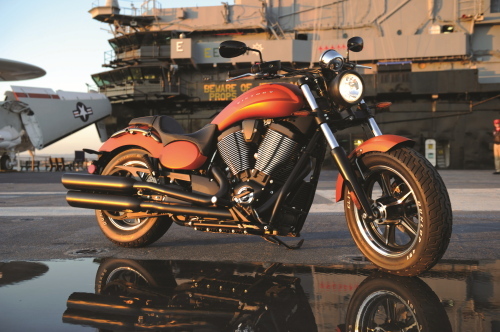 The Judge marks a change in Victory’s recent product offerings, but where the Minnesota-based company continues to stick to business-as-usual thinking is by placing its powerful Freedom 106/6 50-degree air/oil cooled, fuel-injected V-Twin with six-speed gearbox in yet another Victory motorcycle. This same engine that motivates many Victorys now also gives the Judge its go power. We’ve ridden the Freedom 106/6 many times over the years, and always come away impressed by how much bang for the buck it gives. 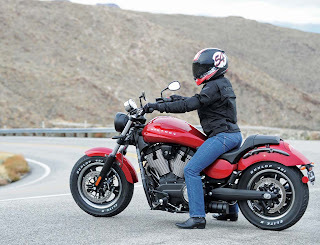 The Judge’s drag-style handlebar and bodywork are all new, as is the styling of the taillight, fender struts and new EFI covers between the cylinders. But it’s perhaps the new headlight that’s the biggest departure from Victory’s usual styling cues. 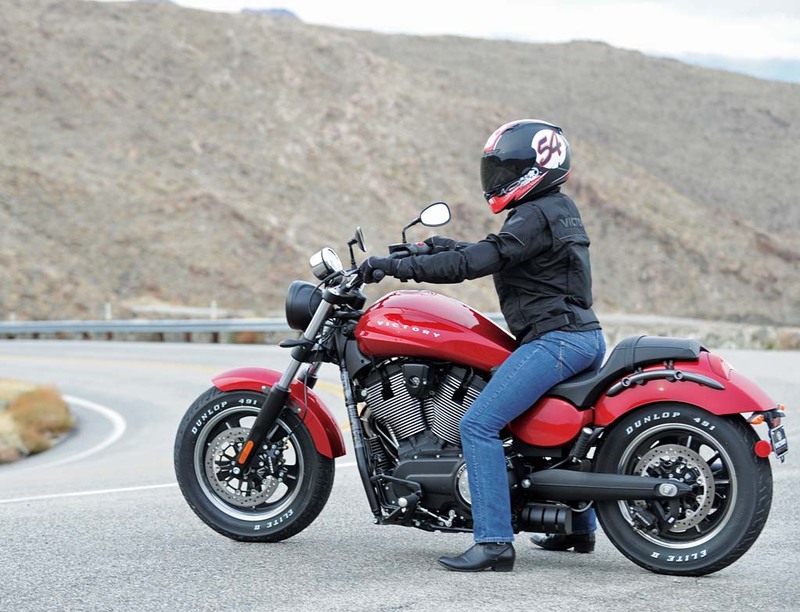 The large, angular headlamp – a signature Victory styling element – seen on all other models, save for the touring models with full front fairings, is replaced by a more traditionally shaped, round headlight. A single instrument gauge sits just above the new headlight. The Judge features new 16-inch 5-spoke cast wheels wearing Dunlop’s 491 Elite II tires (130/90 front, 140/90 rear) with raised white lettering. 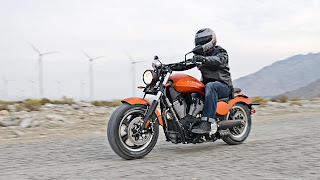 The rear fender is abbreviated and minimized, a styling cue likely intended to enhance the bike’s muscular stance, and just about everywhere you look on the bike it’s been given the black-out treatment. Suspension is typical fare, with a traditional telescopic fork and single mono-tube shock. The good news here is that despite the Judge’s friendly 25.9-inch seat height Victory didn’t sacrifice suspension travel just to achieve such a low seat height. The plush 5.1 inches of fork travel found on many other Vic models carries over to the Judge. 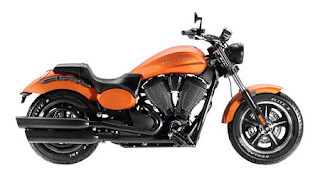 The 3.0 inches of travel out back isn’t quite as much as on some of Victory’s other models but is still better than what’s found on various competitor bikes. A single 300mm rotor with four-piston caliper in front and 300mm disc with two-piston caliper in the rear help keep the Judge’s speedy ways in check. 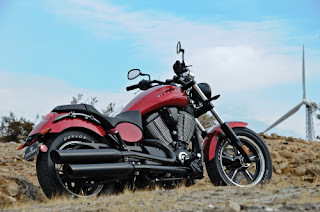 The Judge’s 4.5-gallon fuel tank is the same capacity as on the Victory Hammer S and Hammer 8-Ball, but the Judge’s claimed dry weight of 660 pounds is roughly 12 pounds lighter than its Hammer brothers’ dry weight. The Judge has moderately less steering rake than the Hammers (31.7 degrees vs. 32.0 degrees), but its 6.7 inches of trail is quite a bit more than 5.5 inches on both Hammers. 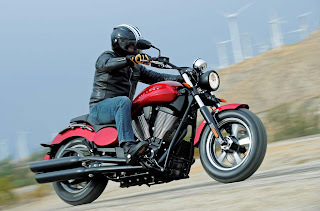 The presumption here is that Victory wanted to give the Judge snappier handling via its tighter rake and a wheelbase (64.7 inches) nearly a full inch shorter than the Hammers’, but employed longer trail to provide stability to complement quick steering action. What will also likely make the Judge steer quicker is its narrow 140mm rear tire. Both Hammers use a fat 250mm bun that slows their steering responses. Color options for the Judge are Gloss Black at $13,999 and Suede Nuclear Sunset or Sunset Red, both for $14,399. The Judge offers a significant savings compared to the $18,499 Hammer S, but some of the Hammer’s extra cost is expected since it provides dual front brakes, along with upgraded wheels and suspension. However, more interesting is the proximity of the Judge’s price to the Hammer 8-Ball’s $14,499. The new Victory Judge looks like an entertaining ride. We’re looking riding it soon!